On 14 February 2019, in partnership with the Rift Valley Forum, the Institute for Poverty, Land and Agrarian Studies (PLAAS) of the University of Western Cape, and APRA conducted a panel discussion to disseminate a new report – ‘Participation, Voice and Governance in investment corridors in Africa: the case of LAPSSET’. The report examines the extent to which smallholder farmers, fishers, women and youth have been included in the implementation of LAPSSET in Lamu County – where the corridor is set to begin – and its potential impact on these communities. The findings were shared to a group of about 40 national and local stakeholders, representing donor and local activist organisations working especially with pastoralists, women and youth on various locations along the proposed corridor. The presentation and report were prepared and written by Ngala Chome, a researcher and doctoral candidate at Durham University in the UK. The report offers a fresh and insightful take on how LAPSSET may intersect with local livelihoods, as well as how people are anticipating this change, especially by applying various options that have been accorded to them by a new constitutional dispensation since 2010, that has given prominence to a language of communal consultation and participation in the public-policy making process. Local activists and politicians are taking advantage of key attributes of Kenya’s 2010 constitution, such as a reformed judiciary, an expanded bill of rights, new land laws, and political devolution so as to mobilise local voices regarding the future direction of LAPSSET. To a considerable extent, such strategies have been successful, as seen through successful legal petitions and the honouring of promises by the national government for financial compensation over land acquired for LAPSSET projects. However, as the panel which discussed the report’s findings submitted, much needs to be done to ensure that local voices are promoted, and that their vision for the future development of the corridor is seriously considered. Kang’ethe Mungai, the manager of the Mpeketoni Co-operative Society which represents about 3,000 smallholder farmers on Lamu’s mainland, and one of the panellists at the dissemination, emphasised Lamu’s agricultural potential, but stated that this has been largely ‘ignored’ by the government, constraining access to inputs and markets as a result. However, the fear that LAPSSET might help to induce more negative consequences for local livelihood systems is perhaps more widespread on and around the Lamu archipelago. Firstly, this is related to the existence of more informal land claims – most of the land is classified as Public Land that belongs to the National Government – a trend that explains local fears over potential loss of land, to planned LAPSSET infrastructural projects, and then to large-scale investors. Fishermen have also reported diminishing fisheries catch – perhaps caused by the on-going dredging around the port area – as was explained by Somo A. Somo, the Chairman of the Lamu County Beach Management Unit, and one of the panellists during the meeting. In Lamu, a voluble political environment regarding the fate of LAPSSET – through which various demands for communal consultation, communal safeguards and for comprehensive environmental and social impact assessment reports have been made – the voice of women and youth is faint. 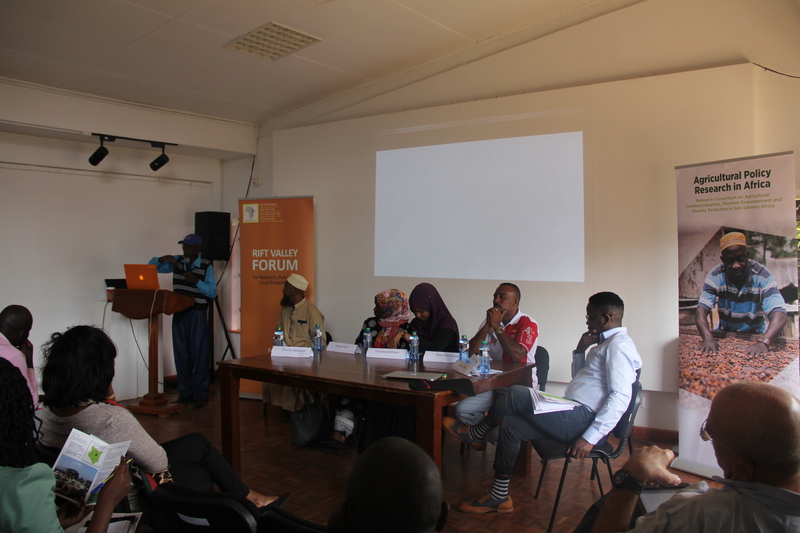 As Khadija Juma, a member of the ‘Save Lamu’ organisation who was also one of the panellists at the meeting, stated that women were sidelined during the financial compensation for plots of land acquired for LAPSSET in 2015; and in most discussions regarding LAPSSET more widely. This side-lining, Khadija warned, should be corrected in advance of any major investments in future, as men may position themselves for disproportionate advantages at the expense of women. Umulkher Athman of the Lamu Youth Alliance expressed concern during the meeting regarding the promise of future employment opportunities, especially for younger people who were born and raised in Lamu, where there has been a history of minimal investments in educational facilities. In sum, the panellists and audience agreed that LAPSSET has already unleashed vigorous local debates regarding the future distribution of its costs and benefits. The lesson, for other counties that will be traversed by the corridor elsewhere in Northern Kenya, is that these local ‘contentious politics’ are not only determining the current progress of LAPSSET – as targets shift, priorities are reset, and outcomes renegotiated – but will also influence its future political direction, including who will get what, and when, where and how this will happen. Click here to access to the full podcast of the event.